It's rather cold today, so I thought I would wear my nice chunky sweater. It's got a very unique shape (I think it looks like a pumpkin with arms) but it's so warm and cozy! To watch my outfit of the day: CLICK HERE! My hair looks total poo in these pictures because I haven't had a chance to style it yet.... sometimes the hair gets a little abandoned with all the other things going on in my day :) As long as I can put my makeup on, get dressed and make these videos for you guys.. then thats ok if I have a bit of a poo hair day! Plus.... I'm totally hating my hair color right now. I can't decide what to do with it but I just hate how gold it's getting, now that the lowlight and highlights are blending into one :( Any ideas??? OH HOW I LOVE THESE BOOTS!! They are seriously my best buy of life!! FOR SURE! HAIR: Best Pebbles look of life ;) LOL WHAT A WRECK!!!! 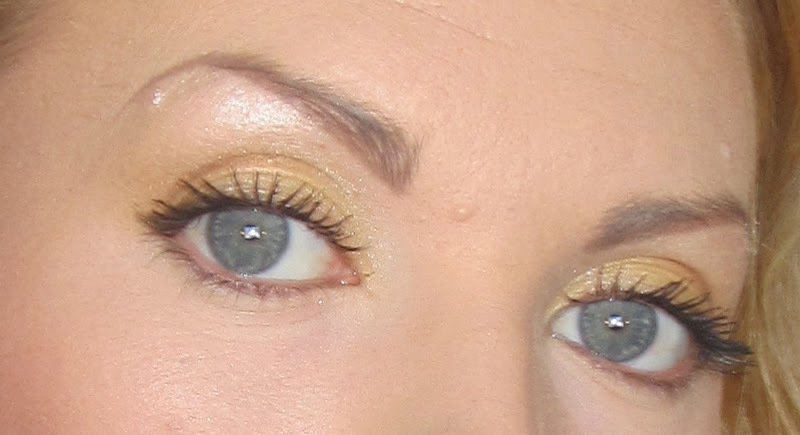 I wanted to match the yellow in my shirt, so I decided to do some nice bright yellow on my lids. 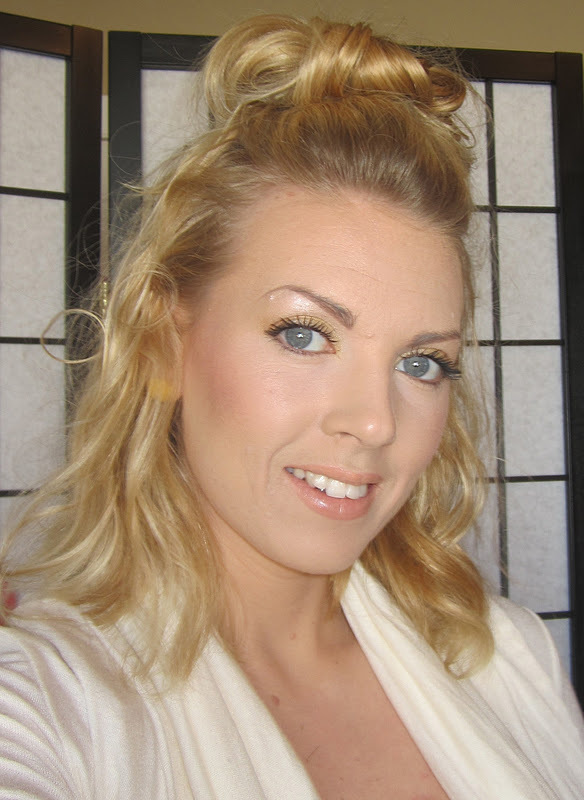 I actually dont wear yellow on my eyes very often but it does compliment blue eyes quite well :) And it makes me feel sunny, even though its cold out. Natural Collection in Peach Melba? i love your hair, but if you want to change the color, maybe a very light brown would look great on you. I'm sure any color you would totally rock! 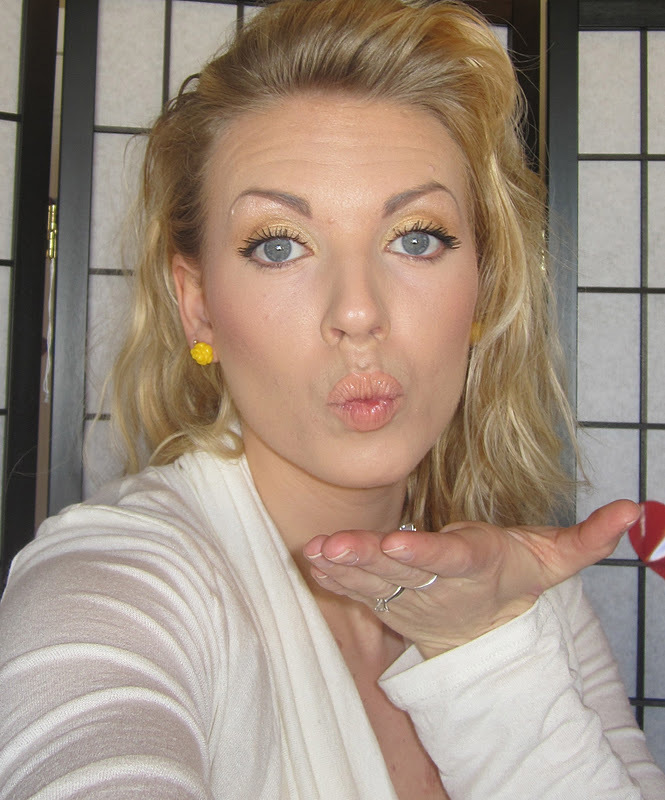 I love THE look and THE yellow eyeshadow!!! Please donate that sweater to Goodwill! It's shapeless, makes you look so much heavier than you really are, and looks so frumpy. :( There are so many other warm sweaters that would look great on you! I, too, agree with getting some new dark skinny jeans! Seriously?? and you only go to SAM's club or Walmart with that outfit, are you freakin kidding me??? LOL you look like a joke! Go back to how you were dressing up before coz that suits you best. Maybe get some wigs since your never happy with your hair?? Get some dark wash skinny's they would look great on you!! wow some folks sure do nit pick...anyway i think you look good, there's nothing wrong with the outfit....maybe perhaps some people would like to buy and send you some dark skinny jeans instead of picking your outfit apart? is that the point of outfit of the day to get people to pick you apart? i'm seriously asking because i'm new to this you tube beauty reviews and outfit reviews....anyway i like your hair color as well. thanks for sharing! Love the outfit and that sweater! Sam, I think you would look lovely as a brunette not too dark though. I remember when you had red hair, that was really pretty also, really made your eyes pop! Please stay blond and THE way you are Sam, You look good! Sam, you look great the way you are. You had your baby 11 months ago and I have to say, all that breastfeeding sure helps you lose weight fast. You look fabulous! Thank you for always inspiring me and everyone out there who are inspire by your OOTD and beauty videos. Love you Sam!